Bar snacks available, Home made sandwiches and toasties. Timothy Taylor and John Smiths Cask, available also why not try Carla`s World Famous White Sangria. Weekend deals on bottled beers, regularily changing. Also a large screen showing all sports, pool table. The Cross Pipes was built circa 1762 as two cottages and an Inn. The whole of the Cross Pipes property, which is really of 2 blocks, was built about 1762 as two cottages and an Inn, the centre cottage being later added to the hostelry and the other cottage on the east side being demolished. At the side of the Cross Pipes was an archway and brewhouse, with a malt house and stables for two horses at the rear. 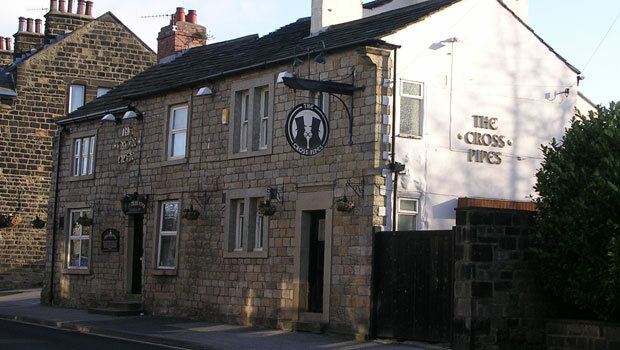 It was the last Otley Inn to brew its own beer. Has the CROSS PIPES got a ghost? Stuart and Sue Rothera, landlord and landlady, began experiencing strange happenings after they took over the tenancy in October 1985. In January 1986 a pile of boxes fell over in the kitchen which had been there all day and no-one had touched them. Also, one afternoon, their daughter Haley and her fiancé Phil, decided to have a game of darts when the Pub was closed. Phil threw three darts into the board and then went on to play pool. Whilst playing pool, first one dart jumped out, followed by a second and a third. Phil threw the darts back in again and they jumped out again later. However, previous landlords have also experienced strange happenings, which include the bathroom door being locked from the inside when there was no-one in it, and the hand-piece of the telephone jumping off its cradle. One Landlord parked his car on the steep east side of the car park adjacent to the Inn and the next thing he knew it had run into the middle of the road on its own. Luckily it didn’t cause an accident, and when the brakes were tested they were still on and in good working order!